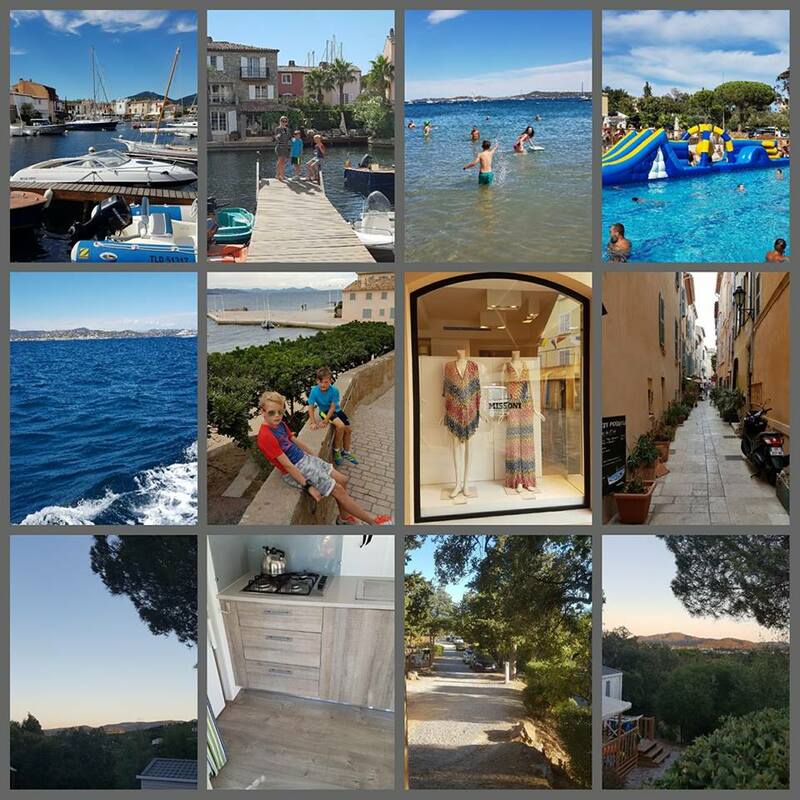 Home » Uncategorised » Family Holiday this year to France! So, got a lot of messages about our trip to France & staying in a mobile so here goes. This was a last minute holiday for us, only decided to go in July. We flew Ryan Air to Nice (yes one hour delay going out and even more of a delay on the way back. I will not rant. I will not rant). Anyway that was the only moan I have. As it was a late flight we stayed one night in the IBIS airport hotel and then hired car next morning. We had booked it ahead of time with Gold Car – really good value, about €150 for the week for a medium sized car. I just found them on Google so was dubious, but all good . The drive was just over an hour and after initial shouting from me as co-driver….watch it, watch it, slow down, speed up, did you see that? what’s that noise? All was grand. The campsite we stayed in was called Domaine des Naiades in Port Grimaud with Eurocamp Holidays. It’s a medium sized park with a pool, 2 slides, restaurants and bar and full entertainment and kids clubs (for kids who will go…ours have just never gone!!!! Much as I have begged and bribed). We stayed in a two bed Vista mobile with pull out bed for Amy and air-con and decking. Air-con is a must!! We learned that the hard way a few years ago when we all melted. Our kids are 13, 10 & 8 so no baby pool anymore but it’s there. They spent the time on the slides and jumping in the deep end, it’s very deep. The also had a full on inflatable obstacle course one day, like wipe out – brilliant! I overexposed myself. Great laugh. The Eurocamp team are really friendly and helpful too, there all the times….even when we had a “I can’t find a corkscrew” emergency. The food onsite was really good, especially the Pizza Blenti. The chef has won some pizza awards apparently. All the food in the area has a bit of an Italian influence and loads of seafood. The beach is about a 10 to 15 minute walk away as is the town of Port Grimaud. The beach is lovely, soft sand and nice bars and restaurants. The town though, wow! It is so picturesque. Like a mini-Venice. All piers and canals and houses with decking onto the water. It’s like a scene from a play or something. Green shutters, pretty chairs, quaint side streets and a church and the square for the market. Loads of massive boats as well for the rich! We took a trip to St Tropez one of the days. It’s just 15 minutes away by boat. Another stunning place, full of the mega rich and their boats. It was nice for a visit and to see all the shops and pretty side streets. Missoni, Diane Von Furstenburg etc all high end and the boats and cars high end too! Was good to see it all but I liked the calmness in Port Grimaud. « Well used to my lenses now!